This round should have been held at Halifax but on Thursday the venue was switched to Hyde after discovering the Halifax venue had been double booked. One benefit of the Hyde venue is the corner shop doing bacon butties all day. You can see the remnants of one of them in the first photo if you look closely. We missed the last round at Derby and so feared we’d be a bit rusty. We were using an Early Russian army, with lots of superior cavalry and one block of superior knights, which lacks real punch in competition games so we knew we’d a have to be patient. After two rounds we were averaging 30 points a round. I felt we’d do well to match that with this army especially as our higher placing in the league would pit us against better players right form the off. This turned out to be correct but I am pleased that we managed to win a hard game and get 6 points whilst losing; previously our losses had resulted in hardly any points at all. We are still on course to meet our aims for this season. Graham and I have played Alan Cole & Paul Carter twice before. Once in March 2011 and once earlier this year. The previous games had been played in a great spirit and were lots of fun. This game was no exception. In the first game this season our class three Early Russian army scored a heavy 29-1 win against a medieval army with lots of superior knights. This time our class two Early Russian army tried to do the same against a late medieval army with lots of superior knights. A class two Early Russian army tends to have more superior cavalry than the class three variant. However, tried is the operative word. Faced with four battle groups of superior knights and two of lance armed light horse our right flank collapsed very quickly. Oh and I lost the general controlling that flank in the second round of combat which didn’t help. A defeat was always the most likely outcome after this. Sadly we lost one battle group as I forgot one of the more obscure rules. A group of cavalry had evaded from some knights who caught and broke some light horse instead. In the pursuit they caught the cavalry that had evaded previously when in fact they should have evaded the pursuit (Field of Glory, 1, 108). Surprisingly they didn’t break quickly and had they got away I doubt it would have done nothing except delay our eventual defeat. However, it was a good learning point. 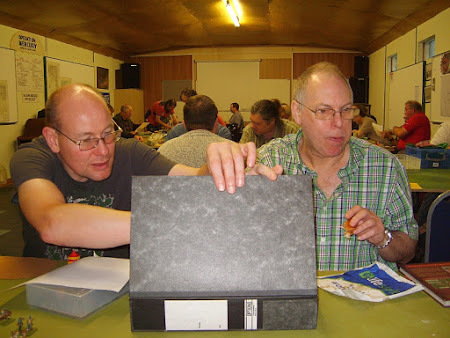 The second game was against the two Daves: Hutchby & Elltringham. They had paired up because their regular partners weren’t available (hence the quizzical looks). Again a great pair of players and we had an enjoyable game which included one of the biggest, and most complex, melees I’d seen for a while. It was so big all four of us got involved in working it out at one point. 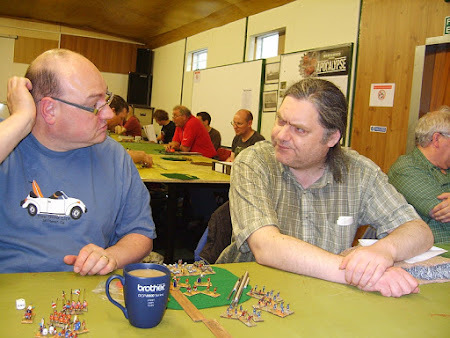 The game started badly for us as Dave (E) made good progress on our right with a large body of lance armed cavalry. After dispatching our only group of superior knights, and some cavalry too, with some ease, things looked bad but Graham managed to recover. The pressure eased and the Dave’s began to loose battle groups. We even managed to sack the camp with some very tired light troops who’d managed to hook round the right flank unmolested. On our left battle was joined as the superior cavalry, supported by one group of armoured spear, charged into a solid line of spear mostly supported by medium foot bows resulting in the large melee mentioned previously. Slowly we began to destroy more battle groups. Unfortunately, the broken groups of spear didn’t cause any problems to their friends but eventually things started to swing our way. One group of Russian superior cavalry finally broke a group of superior lancers and pursued into the flank of a block of spear and supporting bow who’d been turned to protect another group’s flank. Plus, once the lancers were gone, our light horse charged two units of poor light foot that had strayed out of a village catching both in the rear. Gaining four or five victory points, I can’t remember which, in consecutive bounds won us the game. I wouldn’t say it was against the run of play but I certainly would not have predicted the outcome after the first four bounds. gilles " thefrenchjester unmasked ;-) "
This was the big learning point in the first game; the cavalry could, and should, have evaded a second time in the impact phase. I too checked it with Hammy after the game.